The entryway is such an important part of your home because it's the first place visitors see when they walk through the door. Having a functional, uncluttered space will not only make a great first impression, it will make your life easier and more manageable. There's nothing worse than tripping over kids toys when you step inside, or not being able to find the car keys/umbrella/dog leash as you are rushing out the door! Depending on what pushes your buttons, whether it be clever storage or eye-catching decor, this list should give you some great ideas. If you have a large family or want to be super organised, then a storage cabinet like this is the way to go. DIY hooks are great for hanging coats and bags and cubby holes hold storage baskets, which you can personalise with name tags. There's even room for sporting equipment and the dog leash. Pull out drawers at the bottom provide extra space for stashing keys, mail... anything really! Put a message board on the wall or up against a side table to stick coupons, tickets, notes or outgoing mail. This is a great way to ensure you don't forget the important things! Pendant lights make a big impact visually. Entrance hallways with high ceilings look great with two or three in a row. I love this understated look. Beautiful styling by one of my favourite stylists and blogger Annaleena Leino, using basic nails as hooks. An eye-catching rug like this one is very welcoming as well as being practical, and a free standing clothes rack provides a great place to hang coats. 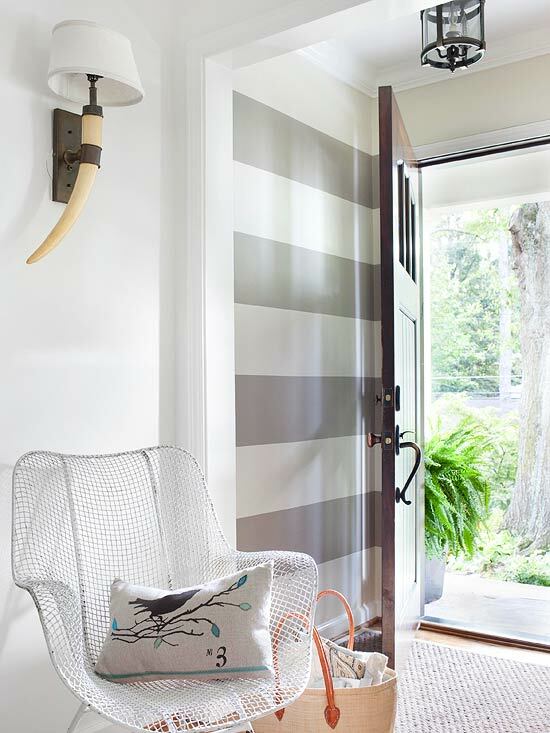 Add personality to you entryway by painting the walls in a bright colour, bold stripes or choose a graphic wallpaper. If you love chairs, like I do, then why not place one by the front door? If you have stairs leading up (or down) from your entryway, storage baskets on the steps are a good place for bits and bobs. Oh, and you can never go wrong with a design classic like this Eames Hang it all! These pastel hooks are so pretty! I love the aesthetics of placing them at different heights and it's practical too - the kiddies can reach their things! I also love the wire storage basket. Perfect for umbrellas. Not only do mirrors look great, you can check your appearance before you run out the door! I love the effect of this circle mirror against the striped wall. A side table is great for displaying lovely things like photos or a lamp. It's also handy for a phone and/or message pad and pen. A bench seat is also really handy for an entryway, not only as a home for your things but as a place for putting on shoes. A lovely piece of art will create a warm and inviting space. The owners of this LA home are photographers Lou Mora and Sarah Yates. Such impeccable styling! I hope that you've seen something here that inspires you. If anyone has any other ideas for a great entryway, please do share. I'd love to hear from you! Aren't they? I'm so glad you're inspired to DIY. If you do, I'd love to hear how it goes!